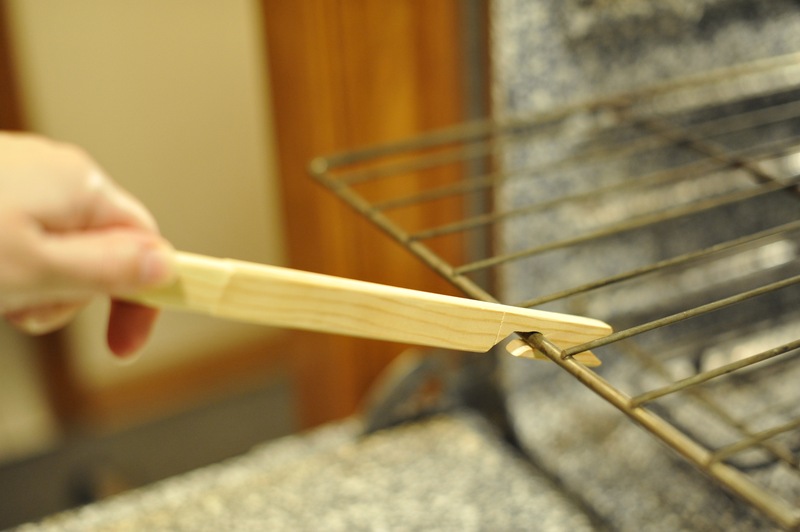 I was watching Baking with Julia one day and and noticed the neat tool she uses to pull out and push in her oven rack. I pointed it out to my husband and he made one for me! 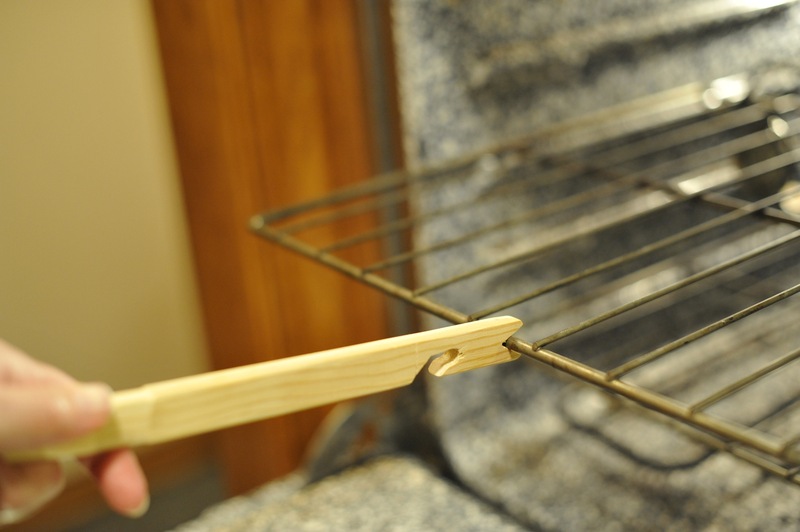 My oven rack does not glide in and out effortlessly, so the tool has been really handy and I think it’s spared me from some wrist burns. I can use it to pull the rack out. And to push it back in. Earlier this year, I got hooked on watching America’s Test Kitchen. Frequently, they’ll review gadgets and kitchen equipment, and frequently after watching, I ponder whether I need a new or upgraded item in my kitchen. 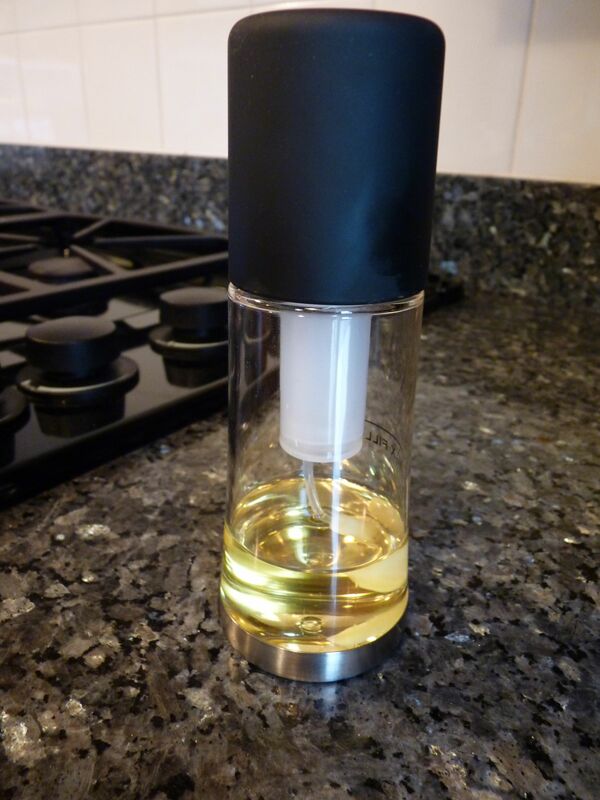 One item I decided to purchase is an Orka Flavor and Oil Mister by Mastrad (I bought one from Amazon for about $13). I’ve had it for a few months and haven’t felt the need to reach for the aerosol cooking spray I used to rely on. 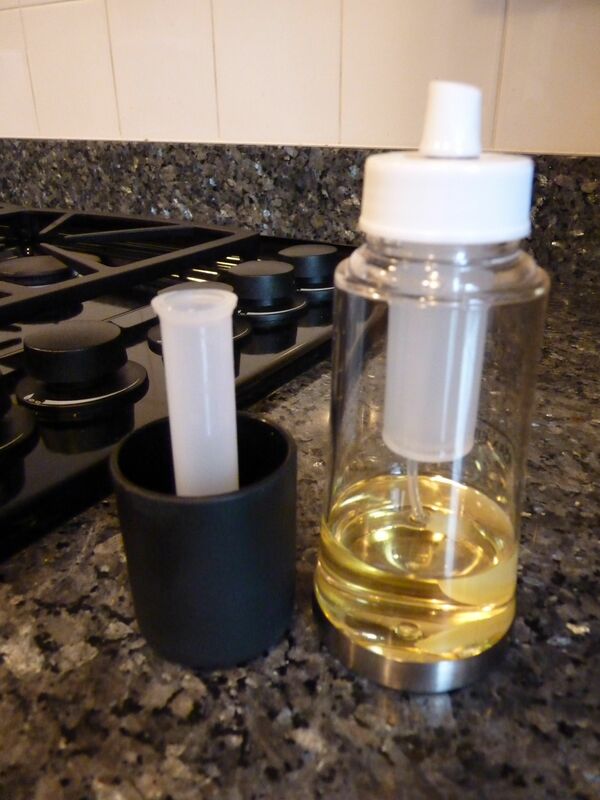 To use it, fill to the fill line with the oil of your choice (I use canola), pump the lid a few times to build up some pressure, and then spray. You’ll need to pump each time you use it. The mist isn’t as fine as an aerosol can, but it provides even coverage and it’s worked well for both baking and cooking. 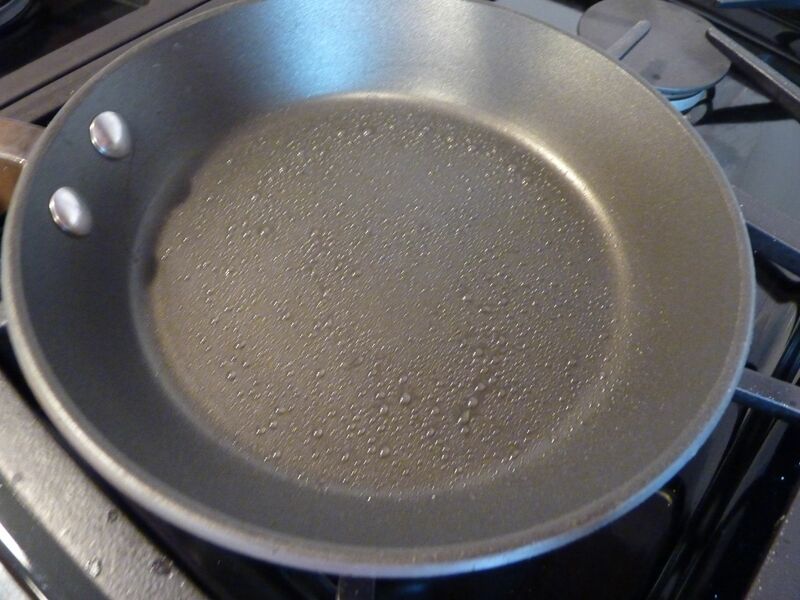 Here’s a picture of a pan that I sprayed, plus a couple of views of the mister. 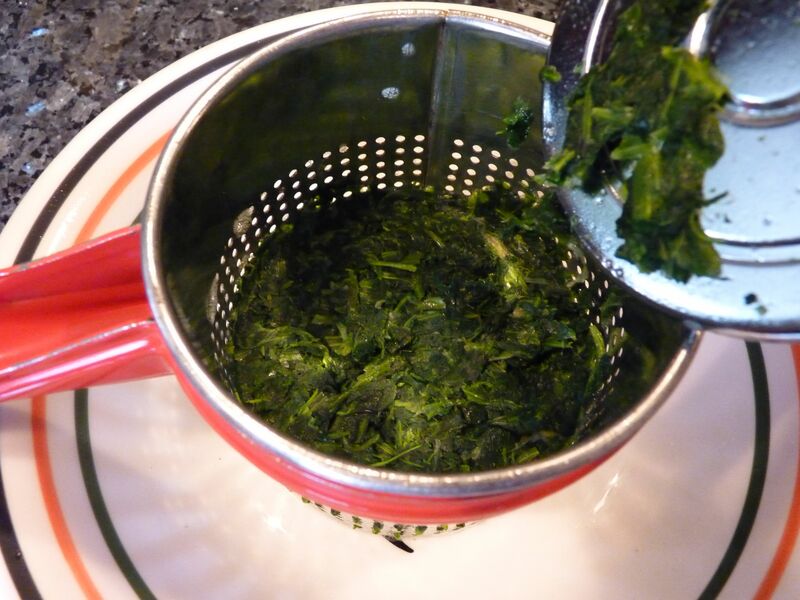 I used to dread squeezing the water out of thawed frozen spinach. Using a strainer or cheesecloth is awkward and messy. Sometimes I’d do a shabby job and would end up with too much water in whatever I was cooking. Then I discovered that a potato ricer is the perfect tool for spinach! A 10 ounce box fits perfectly. 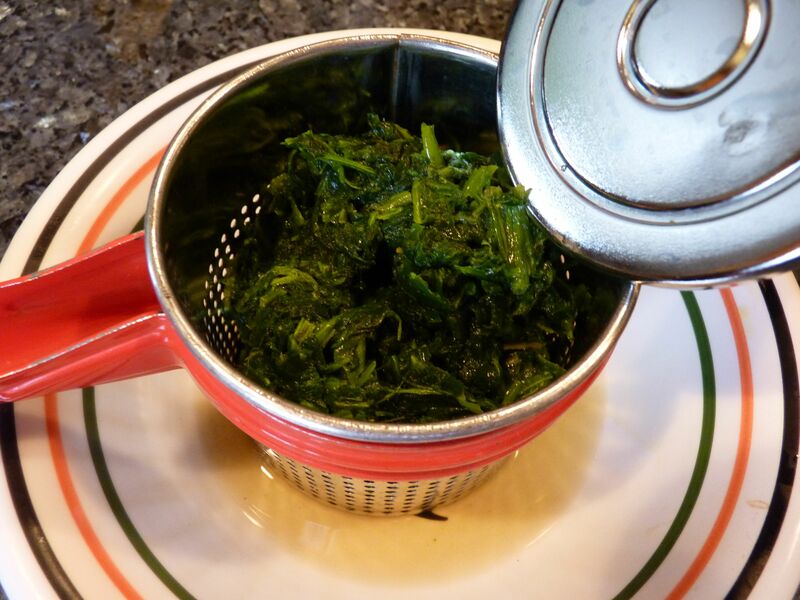 After a quick squeeze, the spinach is ready to be scooped out with a spoon or spatula. I also like to use my potato ricer when making mashed potatoes. I put cooked potatoes into the ricer, and squeeze them a mixing bowl, then add the rest of the ingredients and mix with a stand or hand mixer. 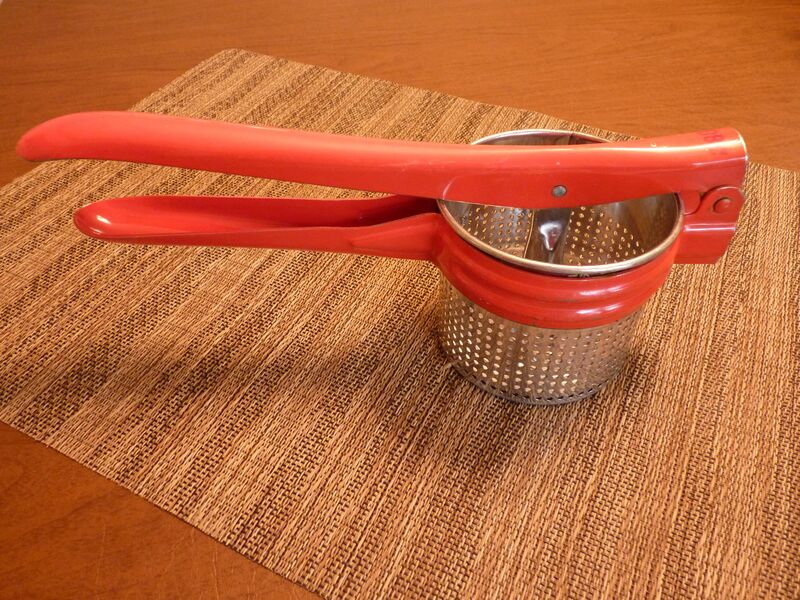 My lovely all-metal ricer was handed down from my grandma. 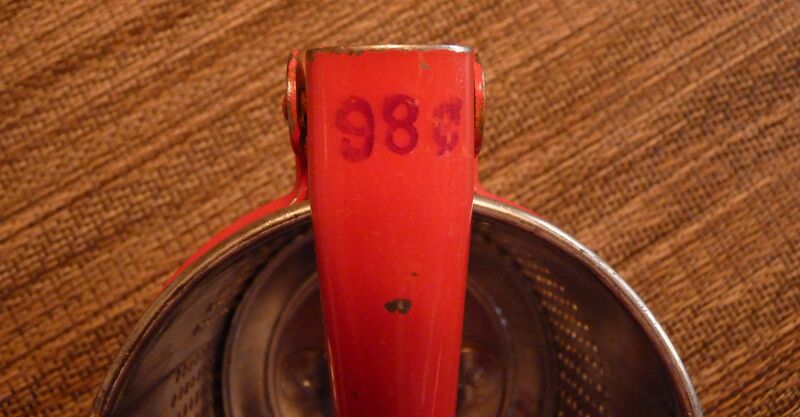 I’m amazed that the price stamp hasn’t washed off after all these years. It makes me laugh every time I use it! After seeing a lot of cute chalkboard labels on containers, I decided to make my own. I bought a roll of chalkboard contact paper, a paper punch, and chalk. 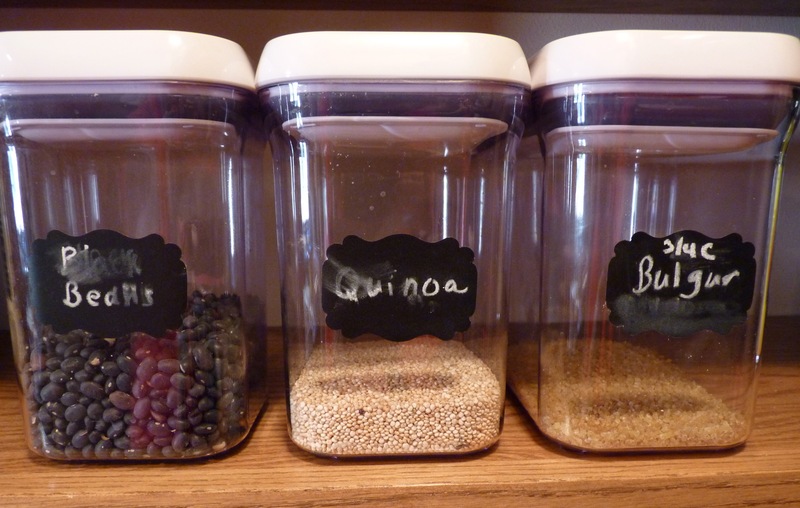 I punched some labels and put them on my pantry containers. So far, so good. Then I wrote on the labels. My non-artistic handwriting, combined with the cylindrical pieces of chalk, didn’t result in an attractive label. I dug up a sharpener for a long-gone “chubby” makeup pencil; it did a good job of sharpening the chalk, which made it easier to write on the labels. And then. I used the containers and realized that when I grabbed them, my hand smudged the chalk. Even now that I know I’m going to smudge it, I still manage to grab the containers in a way that I smudge the label. So, they kind of work, but I’m not holding my breath for my pantry to be featured in a home decorating magazine! 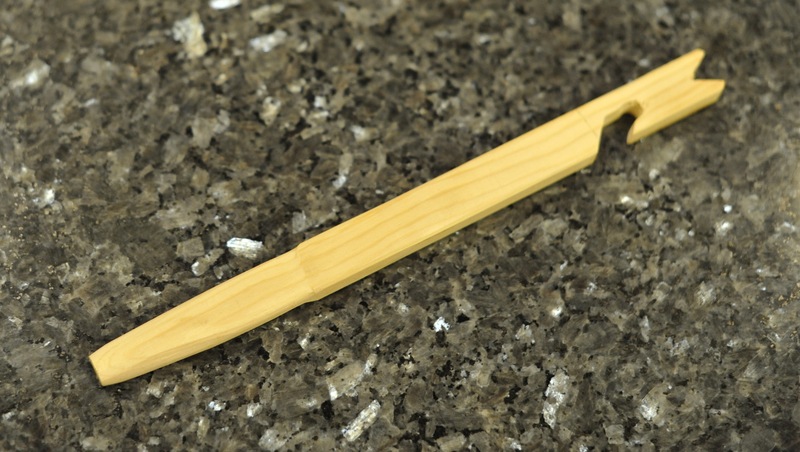 You are currently browsing the archives for the Kitchen Tools and Tips category.